This article is about the event. For the related book, see Night of Tears (book). The Night of Tears is the night an Elven force attacked and burned the first human city of Skyrim, Saarthal, built by the first Nordic inhabitants. In retaliation, Ysgramor, the leader of the human colonization effort and the founder of the Companions, drove the elves out of Solstheim and Skyrim. The reason for the Night of Tears has been lost to time, but it is speculated that it was spurred by a discovery of something beneath the city of Saarthal, which prompted the elves to destroy the city to claim the power for themselves. 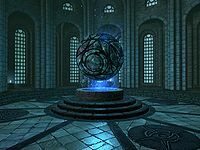 While it is impossible to know if this was the true cause for the Night of Tears, it was later discovered by the College of Winterhold that a powerful artifact was hidden within the ruins of Saarthal, which they dubbed "The Eye of Magnus". Another theory, proposed by Imperial scholars, is that the elves feared that the humans' culture would surpass their own and so sought to drive the humans from their lands. This page was last modified on 27 February 2019, at 20:33.